In 1951, the author introduced the first edition of his book, entitled "Aerodynamic Drag". 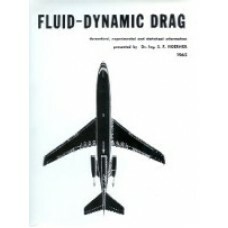 It is the author's objective in this book, to present information on drag or fluid-dynamic resistance in a comprehensive, generally-valid and intelligible manner to students, engineers and researchers. The text is not always a "handbook", however, giving ready results. The reader is expected to work out the desired information himself, considering cause and effect involved in the problem he wants to solve. It is primarily the aeronautical engineer who is interested in aerodynamic drag problems, so that he can predict and possibly improve the performance of airplanes. The principles of aerodynamic drag, many detailed data, and some special sections in this book should, however, find interested readers in several other fields of engineering as well - in the design of automobiles, in shipbuilding, in the construction of chimneys (wind loads), in the design of high-speed railroad trains, in machines applying aerodynamic or hydrodynamic forces, and finally in the design of ventilation systems. "Aerodynamic Drag" was originally written in 1945 and 1946, as a result of the author's experience in German research and industrial organizations (such as Junkers and Messerschmitt). Many additional and more recent data have been added, however, during the translation in the following years. Besides air, the medium of water is most predominant in practical applications of fluid dynamics. In the second edition another chapter has also been added, presenting wind loads on various types of structures, especially buildings. Appearance of the text and readability of the illustrations have been improved. The 1965 edition differs from the preceding one, as follows: A number of misprints and some mistakes have been eliminated. "Drag in cavitating flow", in Chapter X, has been rewritten. Hypersonic characteristics such as in missiles and re-entering vehicles, are presented in an added chapter. The "atmospheric properties" in Chapter XIX, have completely been rewritten. A section has been added, dealing with the aerodynamic drag, ranging from base-vented hydrofoils to characteristics at supersonic speeds, has been collected in this chapter. In the second edition of his book, Dr. Hoerner has added two chapters on hydrodynamics; the title has been changed accordingly. It is certain that this expansion of scope will meet with approval from all who are working in the field of "fluid dynamics". Dr. Hoerner has succeeded in producing an outstanding treatment of the subject; so that we now have an entire book concerned with but one of the six components of the total aerodynamic force. And it is not just another book. It is an exceptionally well written, systematic treatise showing a splendid balance between the theoretical and the experimental approach. The presentations are always made with great clarity. It is safe to predict that this volume will be well received, not only by aeronautical engineers but also by all who have any concern whatever with aerodynamic or hydrodynamic drag. The whole field of transportation is involved, and many will find here for the first time a readily usable compilation of basic data. Only those who have tried to evaluate, to compile, and to correlate data in the form as it has been done in this book, can fully appreciate Dr. Hoerner's effort. Dr. S.F. Hoerner studied mechanical engineering at the Institute of Technology in Munchen (Dipl.Ing.) he earned a degree as Dr.-Ing. in aerodynamics at the Institute of Technology in Braunschweig, and he obtained a degree as Dr.-Ing..habil. from the TH Berlin. He served at one time as research assistant at the Deutsche Versuchsanstalt Fur Luftfahrt (DVL, near Berlin), as aerodynamicist in the Fieseler Corporation (working on the first STOL airplane, the "Stork") and later for a time as head of design aerodynamics in the Junkers A.G. He was then research aerodynamicist at the Messerschmitt A.G. After World War II, he was invited to come to the United States, where he worked in aerodynamics at Wright Field, Ohio. For some years he has been acting as specialist for aerodynamics and hydrodynamics in the field of naval architecture at Gibbs & Cox, Inc., New York City.